9122ABAdjustable Floor Lamp - Antique Brass Cw Sca..
5026ABAdjustable Floor Lamp - Antique Brass This A..
73080An LED mother and child floor light finished ..
73081An LED mother and child floor light finished ..
Alta Modern LED Floor LampSimple, Stylish A f..
ALTESSE-FLNIA 2 light floor lamp finished in polis..
71620The Andromeda floor light is a stylish fittin..
1037CCArcs Floor Lamp - 1 Light Cc/white Shade Blk..
1013CCArcs Floor Lamp - Chrome/black Shade Silver ..
73571The modern, geometric design of the Cassier f..
9053CCCatalina 1 Light Floor Lamp, Chrome, Smoked ..
7034CCClover - Led Floor Lamp, Chrome, Clear Cryst..
7023CCClover - Led Table Lamp, Chrome, Clear Cryst..
2112CCClover 2 Light Led Column Floor Lamp, Clear ..
CHASSELASA walnut coloured, wooden floor lamp fini..
1012ABDrum 1 Light Floor Lamp, Antique Brass, Line..
7550CCDrum Floor Lamp - Chrome Round Base Ivory D..
5663-3CRDrum Pleat - 3 Light Floor Lamp Cream Plea..
5663-3SIDrum Pleat - 3 Light Floor Lamp, Silver Pl..
72424This Evelyn floor light has a rotating arm de..
6502ABFisherman Floor Lamp, Antique Brass, Clear G..
6502SSFisherman Floor Lamp, Satin Silver, Clear Gl..
5029ABFlemish Floor Lamp, Antique Brass, Mink Plea..
8880BRWaverley Floor Lamp 1 Light Brown Wood/ss Re..
2965WHFloor Lamp - Chrome, White Glass Balls & Dru..
8194CCFloor Lamp - Chrome/glass Cw White ShadeChro..
1080SSFocus Floor Lamp, Satin SilverBrighten your ..
5285-5CCGiraffe 2 - 5 Light Led Arch Floor Lamp, C..
3085-5CCGiraffe - 5 Light Floor Lamp, Chrome, Whit..
914Giraffe - Chrome Floor LampThis Chrome Giraffe ..
914CUGiraffe - Copper Floor Lamp, Black BaseThis C..
4185-5CUGiraffe 5 Light Floor Lamp, Sand Copper, B..
72388An elegantly arched floor light finished in b..
5430ABLed Mother & Child - Antique BrassBrighten y..
5430CULed Mother & Child - Antique CopperAdd two s..
5430CCLed Mother & Child - ChromeThis pretty floor..
5430SSLed Mother & Child - Satin SilverProvide a s..
73084An LED mother and child task floor light fini..
73085An LED mother and child task floor light fini..
73087An LED mother and child task floor light fini..
2028CUMacbeth Industrial Adjustable Floor Lamp, An..
MONACO-ANA tall 2 light floor light comprising of ..
MONACO-SCA tall 2 light floor light comprising of ..
6541SSMoroccan Fretwork Table Lamp, Shiny NickelTh..
EH-NAUTICAL-FLThe Nautical is a large floor lamp w..
70563A 2-light floor light finished in a bright ni..
60803A 2 light floor light finished in a bright ni..
5679CCPlatt Led Floor Lamp, ChromeThis floor lamp ..
6087CCPlexus 1 Light Floor Lamp, Mesh Shade, Black..
2813RURibbon Led Twist Floor Lamp, Rustic Black/go..
RIMINI-BCFloor lamp finished in black chrome with ..
RIMINI-CHFloor lamp finished in chrome with a push..
ROME-ANA tall 2 light floor lamp with a double sta..
ROME-BCA tall 2 light floor lamp with a double sta..
ROME-CHA tall 2 light floor lamp with a double sta..
ROME-SBA tall 2 light floor lamp with a double sta..
ROME-SCA tall 2 light floor lamp with a double sta..
8093ABSphere 1 Light Floor Lamp, Antique Brass, Op..
5962-2BWDiablo 2 Light Led Floor Lamp, Matt Black ..
5962-2BGDiablo 2 Light Led Floor Lamp, Matt Black..
5015Studio Adjustable Stage Light Large Head Floor..
3013Studio Adjustable Stage Light- Floor Lamp - C..
FO1101ABSwing Arm Xlframe Only - Arc Arm Floor Lam..
FO1101CCSwing Arm Xl Frame Only - Arc Arm Floor La..
FO1101SSSwing Arm Xl Frame Only - Arc Arm Floor La..
2792CCTelescope 2 Light Cylinder Shade Floor Lamp,..
2792BKTelescope 2 Light Cylinder Shade Floor Lamp,..
73145A simple yet stylish floor light in a tripod ..
66987A simple yet stylish floor light in a tripod ..
3540BRTripod - Floor Lamp Dark Wood - Cream Linen ..
EH-TRIPOD-FLBLThe Tripod base is a single light fl..
EH-TRIPOD-FLDWThe Sheeham is a range of wooden tri..
EH-TRIPOD-FLNAContemporary in design, the Tripod f..
3531SSUplighter - Cylinder Column Table Lamp, Gu10..
5222ABUplighter - Linea Antique Brass Scroll Floor..
5222SSUplighter - Linea Satin Silver Scroll Flopr ..
1561SSUplighter - Satin Silver 50w Can Gu10 Haloge..
1230SSUplighter - Satin Silver Halogen PolelightTh..
6021ABUplighter Floor Lamp - Antique Brass Cw Mar..
Elegance Floor Stand - Antique1350mm candlestick l..
Elegance Floor Stand - Brass1350mm candlestick lam..
Elegance Floor Stand - Nickel1350mm candlestick la..
Elegance Floor Stand Medium - Antique425mm ca..
Elegance Floor Stand Medium - Nickel425mm can..
Elegance Floor Stand Small - Antique325m..
Elegance Floor Stand Small - Nickel325mm..
Flexi Floor Lamp - Multi ColoursFlexi neck floor l..
Adonis Task Lamp - A member of the Adonis range.St..
Adonis Double Headed Floor Stand - AntiqueA new ad..
Adonis Double Headed Floor Stand - ChromeA new add..
Adonis Double Headed Floor Stand - Satin Nick..
Have you seen a naked spot in your house which you have no idea what to fill it with? It could be perfect for a floor lamp! A floor lamp is a large free standing light which can stand in any empty spot and provide shade, supply a decent amount of lighting and heightens the rooms atmosphere. 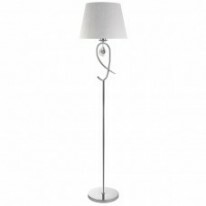 The range we supply will have a floor lamp for everyone, we have all shapes, sizes and colours to match your personal interest and your rooms interior design outlook. If you need help in picking a lamp please feel free to contact us via phone, contact form found on the footer, email or even our instant chat.